"The antecedents of the [American Silver Co.] were the Holmes and Tuttle Manufacturing Company, founded in 1851. They were taken over by the Bristol Brass and Clock Company in 1857, and operated as their silverware department until 1901. In that year, the spoon business was separated from the brass and clock business, and organized under the name of the American Silver [Co.]. They were bought by [the] International Silver Company [headquartered in Meriden] in 1935." Photo - Mattatuck Museum, Waterbury, CT. Possibly Holmes & Tuttle. (1851-55). Teaspoon. (Object ID no. 2010.84.15. Viewed 3 August 2018. H00208). Holmes & Tuttle. (undated). Dinner fork. (Accession no. 1967.155.1.1-.4. Viewed 26 July 2018. C00141-44). Kansas Historical Society, Topeka: fork 1, 2, 3, 4. Holmes & Tuttle Manufacturing Co. (undated). Ladle. Silver plate. (Accession no. 1996.75. Viewed 26 August 2018. J00143). Birmingham Museum of Art, Alabama. Offline - Connecticut Historical Society, Hartford, CT.
Photo - Historic New England organization, Boston. American Silver Co. (c. 1901-35). Dinner fork. (Accession no. 1980.236.76. Viewed 26 July 2018. C00140). American Silver Co. (1905-07). Cold meat fork. Silver plate. (Object no. 1997.062.0010. Viewed 26 August 2018. J00144). Kent State University Museum, Kent, Ohio. American Silver Co. (undated). Spoon. Silver or silver plate. (Cat. no. 2004.11.07.jh. Viewed 16 July 2018. G02874-75). Photo - Chautauqua Institition, Chautauqua, New York. > National United States Silver Plated Spoon exhibited by American Silver Co.
For documentation, see design catalogues and historical information below. Hill & Merrill, Boston (or Middlebury, VT). (May 1855). Advertisement: "Silver Plated Goods. Holmes & Tuttle Manufacturing Co., Bristol, Conn., Sales Room, No. 120 Washington Street, Up Stairs, Boston. Hill & Merrill" [no illustrations]. The Middlebury Register (Vermont). (Viewed 22 September 2018. B00382-83). Online - Chronicling America project, Library of Congress: 2 May 1855, presumably p. 3, col. 5; 16 May 1855, presumably p. 3, col. 4. 1870 - patent - design for handles of spoons, forks, etc. Charles D. Hall, assignor to Bristol Brass and Clock Company. (13 September 1870). Design no. 4348: Design for handles of spoons, forks, etc. (Viewed 21 April 2018. AAA02459). Metropolitan Museum of Art, New York, accession no. 61.670.3. Online - Courtesy University of Connecticut library, Storrs. Ira B. Smith, assignor to Bristol Brass and Clock Company. (25 June 1895; filed 14 March 1895). Design no. 24,433; serial no. 541,810: Design for a spoon. (Viewed 21 April 2018. AAA02460). Ira B. Smith, assignor to Bristol Brass and Clock Company. (19 May 1896; filed 13 April 1896). Design no. 25,502; serial no. 587,416: Design for a spoon. (Viewed 21 April 2018. AAA02461). Samuel J. Large, assignor to Bristol Brass and Clock Company. (22 August 1899; filed 26 July 1899). Design no. 31,428; serial no. 725,201: Design for a spoon or fork handle. (Viewed 21 April 2018. AAA02441). Samuel J. Large, assignor to Bristol Brass and Clock Company. (23 January 1900; filed 30 December 1899). Design no. 32,143; serial no. 742,155: Design for a spoon or fork handle. (Viewed 21 April 2018. AAA02442). Samuel J. Large, assignor to Bristol Brass and Clock Company. (24 April 1900; filed 31 March 1900). Design no. 32,561; serial no. 11,022: Design for a spoon or fork handle. (Viewed 21 April 2018. AAA02438). (29 March 1901). New silver company formed ("The American Silver company was organized here [Bristol] today... is an outgrowth of the German silver department of the Bristol Brass and Clock company..."] The Daily Journal and Courier (New Haven, CT), p. 1, col. 6. (Viewed 22 September 2018. B00384). Samuel J. Large, assignor to Bristol Brass and Clock Company. (9 April 1901; filed 9 March 1901). Design no. 34,341; serial no. 50,521: Design for a spoon. (Viewed 21 April 2018. AAA02451). Samuel J. Large, assignor to American Silver Co. (5 November 1901; filed 8 October 1901). Design no. 35,279; serial no. 77,998: Design for a spoon or fork handle. (Viewed 21 April 2018. AAA02452). (25 July 1902). Annual meetings [with mention of the American Silver Company]. The Daily Journal and Courier (New Haven, CT), p. 7, col. 2. (Viewed 12 October 2018. B00980). Samuel J. Large, assignor to American Silver Company. (3 June 1902; filed 10 May 1902). Design no. 35,929; serial. 106,842: Design for a spoon. (Viewed 21 April 2018. AAA02453). Offline - Connecticut Historical Society, Hartford, call. No. Q 739.23 A512c 1904. Online - Courtesy University of Michigan. (26 November 1904). Use of mails denied American Silver Co. [apparent misrepresentation of the company in Buffalo, NY]. The Washington Times (Washington, DC), p. 2, col. 4. (Viewed 12 October 2018. B00981-82). Online - Courtesy University of Michigan (September 1904, p. 369; October 1904, p. 549). , assignor to American Silver Company. (19 January 1904; filed 17 December 1903). Design no. 36,737; serial no. 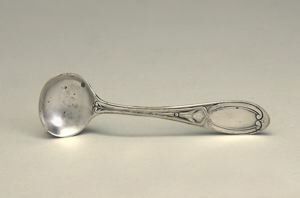 185,595: Design for a handle for spoons or similar articles. (Viewed 22 April 2018. AAA02463). Samuel J. Large, assignor to American Silver Company. (8 March 1904; filed 11 February 1904). Design no. 36,835; serial no. 193,202: Design for a handle for spoons or similar articles. (Viewed 21 April 2018. AAA02439). Henry C. Wright, assignor to American Silver Company. (12 July 1904; filed 1 March 1904). Letters patent no. 764,969; serial no. 195,966: Shutter for chafing-dish lamps. (Viewed 22 April 2018. AAA02464). Everett D. Holley, assignor to American Silver Company. (11 October 1904; filed 9 November 1903). Letters patent no. 772,099; serial no. 218,307: Heat-insulator for vessel-handles. (Viewed 21 April 2018. AAA02454). American Silver Company. (c. 1905). [Catalogue supplement]. Number of pages unknown. [No copy known to be in a public library.] (Viewed 1 September 2018. H00397). Online - citation - American Silver Company. (18 October 1905). Advertisement. The Jewelers’ Circular — Weekly, p. 39. Courtesy Metropolitan Museum of Art, New York. American Silver Company. (October 1905). Advertisement: "’World Brand’, designs that sell..." [with illlustrations showing ten spoons, patterns unspecified]. The Jewelers’ Circular — Weekly. (Viewed 1 September 2018. H00397; H00400). Online - Courtesy Metropolitan Museum of Art, New York: 18 October 1905, p. 39; 25 October 1905, p. 37. American Silver Company. (1 November 1905). Advertisement: "’World Brand’, designs that sell..." [with illlustrations showing ten spoons in the following patterns: Beaded, Berlin, Laurence, Nenuphar, Oregon, Ponce de Leon, Shell, Tipped, Tours and Windsor]. The Jewelers’ Circular — Weekly, p. 35. (Viewed 1 September 2018. D00255). American Silver Company. (November 1905). Advertisement: "’World Brand’ silver..." [with illustration showing seven spoons, patterns unspecified]. [Mentions "catalogue" which either could be from 1904 or a missing 1905 catalogue.] The Jewelers’ Circular — Weekly. (Viewed 1 September 2018. D00258; D00260). Online - Courtesy Metropolitan Museum of Art, New York: 8 November 1905, p. 39; 15 November 1905, p. 33. American Silver Company. (November - December 1905). Advertisement: "World Brand silver, 50% more silver than standard plate..." [with illustration of fork]. The Jewelers’ Circular — Weekly. (Viewed 1 September 2018. D00263; D00266; D00268-71). Online - Courtesy Metropolitan Museum of Art, New York: 22 November 1905, p. 37; 29 November 1905, p. 31; 6 December 1905, p. 29; 13 December 1905, p. 29; 20 December 1905, p. 26; 27 December 1905, p. 29. The Diamond Sign / Spirit J. Vasaly, presumably Little Falls, MN. (29 December 1905) Advertisement: "... American Silver Co.’s flat ware..." [no illustrations]. Little Falls Herald (Little Falls, Minnesota), presumably p. 6, col. 5-6. (Viewed 22 September 2018. B00371). Charles E. Trewhella, assignor to American Silver Company. (12 September 1905; filed 9 May 1905). Letters patent no. 799,581; serial no. 259,503: Vapor-lamp. (Viewed 25 April 2018. AAA02511). Samuel J. Large, assignor to American Silver Company. (10 April 1906; filed 14 February 1906). Design no. 37,942; serial no. 301,083: Design for a handle of spoons or similar articles. (Viewed 21 April 2018. AAA02456). Charles E. Trewhella, assignor to American Silver Company. (27 March 1906; filed 26 August 1905). Letters patent no. 816,514; serial no. 275,864: Percolator. (Viewed 25 April 2018. AAA02512). Charles E. Trewhella, assignor to American Silver Company. (21 August 1906; filed 20 October 1905). Letters patent no. 829,129; serial no. 283,693: Vapor-lamp. (Viewed 25 April 2018. AAA02513). Henry C. Wright, assignor to American Silver Company. (13 November 1906; filed 3 July 1906). Letters patent no. 835,804; serial no. 324,582: Percolator. (Viewed 25 April 2018. AAA02514). Charles E. Trewhella, assignor to American Silver Company. (11 December 1906; filed 10 October 1906). Letters patent no. 838,224; serial no. 338,265: Percolator. (Viewed 25 April 2018. AAA02515). Dwight Stoors Holley, assignor to American Silver Company. (9 April 1907; filed 14 July 1906). Letters patent no. 849,613; serial no. 326,264: Beverage-making device. (Viewed 25 April 2018. AAA02516). Samuel J. Large, assignor to American Silver Company. (25 June 1907; filed 6 March 1907). Design no. 38,635; serial no. 360,988: Design for a handle of spoons or similar articles. (Viewed 25 April 2018. AAA02520). Samuel J. Large, assignor to American Silver Company. (16 July 1907; filed 10 October 1906). Letters patent no. 860,219; serial no. 338,276: Fork and analogous implement. (Viewed 25 April 2018. AAA02521). Charles E. Trewhella, assignor to American Silver Company. (16 July 1907; filed 17 February 1906). Letters patent no. 860,270; serial no. 301,600: Detachable handle. (Viewed 25 April 2018. AAA02518). Samuel J. Large, assignor to American Silver Company. (10 September 1907; filed 13 August 1907). Design no. 38,790; serial no. 388,432: Design for a handle of spoons, forks, or similar articles. (Viewed 21 April 2018. AAA02457). Charles E. Trewhella, assignor to American Silver Company. (24 September 1907; filed 7 November 1906). Letters patent no. 866,985; serial no. 343,380: Percolator. (Viewed 25 April 2018. AAA02519). Metropolitan Museum of Art, New York, accession no. 55.560.2. Charles E. Trewhella, assignor to American Silver Company. (7 January 1908; filed 13 April 1906). Letters patent no. 876,110; serial no. 311,505: Percolator. (Viewed 25 April 2018. AAA02522). Julian R. Holley, assignor to American Silver Company. (15 December 1908; filed 1 February 1908). Letters patent no. 906,629; serial no. 413,865: Percolator. (Viewed 25 April 2018. AAA02523). Samuel J. Large, assignor to American Silver Company. (20 April 1909; filed 23 February 1909). Design no. 39,920; serial no. 479,663: Design for a handle of spoons, forks, or similar articles. (Viewed 21 April 2018. AAA02458). Everett D. Holley, assignor to American Silver Company. (29 June 1909; filed 26 January 1909). Letters patent no. 926,487; serial no. 474,345: Shutter for chafing-dish lamps. (Viewed 23 April 2018. AAA02474). Charles E. Trewhella and Everett D. Holley, assignor to American Silver Company. (3 August 1909; filed 17 July 1907). Letters patent no. 929,901; serial no. 384,221: Electric heater. (Viewed 25 April 2018. AAA02517). Metropolitan Museum of Art, New York, accession no. 55.560.1. Samuel J. Large, assignor to American Silver Company. (18 February 1913; filed 25 May 1912). Design no. 43,573; serial no. 699,809: Design for a spoon, fork, or similar article. (Viewed 21 April 2018. AAA02440). Samuel J. Large, assignor to American Silver Company. (23 December 1913; filed 13 October 1913). Design no. 45,066; serial no. 795,017: Design for a handle for spoons, forks, or similar articles. (Viewed 21 April 2018. AAA02443). Samuel J. Large, assignor to American Silver Company. (2 June 1914; filed 30 March 1914). Design no. 45,885; serial no. 828,407: Design for a handle for spoons, forks, and similar articles. (Viewed 21 April 2018. AAA02444). (26 September 1915). "Made in America" week at Wise, Smith & Company’s [with mention of American Silver Company]. Hartford Courant, p. 4. (Viewed 21 October 2018. D00371). Wise, Smith & Co., presumably Hartford, CT. (26 & 27 September 1915). Advertisement: "’Made in America Week’ Monday, Sept. 27 to Saturday, Oct. 2..." [with mention of American Silver Co. (with illustration, Sept 26 ad)]. Hartford Courant, [26 September, p. 13; 27 September, p. 5]. (Viewed 28 December 2018. D00372-73). Marks Isaacs Co., New Orleans. (14 December 1916). Advertisement: "... Table Ware ... American Silver Co. ... " The Herald Times (New Orleans), possible Christmas supplement, presumably p. 8. cols. 3-7. (Viewed 2 October 2018. B00667-68). Samuel J. Large, assignor to American Silver Company. (19 December 1916; filed 23 September 1916). Design no. 50,068; serial no. 121,895: Design for a handle for a spoon, fork, or similar article. (Viewed 21 April 2018. AAA02446). Samuel J. Large, assignor to American Silver Company. (19 December 1916; filed 23 September 1916). Design no. 50,069; serial no. 121,896: Design for a handle for a spoon, fork, or similar article. (Viewed 21 April 2018. AAA02445). Samuel J. Large, assignor to American Silver Company. (19 December 1916; filed 23 September 1916). Design no. 50,070; serial no. 121,897: Design for a handle for a spoon, fork, or similar article. (Viewed 21 April 2018. AAA02447). Samuel J. Large, assignor to American Silver Company. (19 December 1916; filed 23 September 1916). Design no. 50,071; serial no. 121,898: Design for a handle for a spoon, fork, or similar article. (Viewed 21 April 2018. AAA02448). Samuel J. Large, assignor to American Silver Company. (7 October 1919; filed 21 May 1919). Design no. 53,921; serial no. 298,799: Design for a handle for a spoon, fork, or similar article. (Viewed 21 April 2018. AAA02450). Samuel J. Large, assignor to American Silver Company. (7 October 1919; filed 21 May 1919). Design no. 53,922; serial no. 298,800: Design for a handle for a spoon, fork, or similar article. (Viewed 21 April 2018. AAA02462). Offline - University of California, Santa Barbara library, Special Coll., Romaine Trade Catalogues, Box 1, Folder 3. Online - Courtesy Yale University library. For other maps, search "Bristol, Conn." in search box on Yale site above. Samuel J. Large, assignor to American Silver Company. (4 April 1922; filed 19 January 1922). Design no. 60,752: Design for a handle for a spoon, fork, or similar article. (Viewed 21 April 2018. AAA02449). Samuel J. Large, assignor to American Silver Company. (27 July 1926; filed 10 April 1926). Design no. 70,690; serial no. 16,479: Design for a spoon or similar article. (Viewed 21 April 2018. AAA02455). Online - Courtesy Hagley Museum and Library, Wilmington, DE. American Silver Co. (January 1932). Price list - plated French gray finish. 3 pp. (Viewed 28 July 2018. C00185-02). American Silver Co. (1933). Price list - King George Kensico [price list and brochure]. 2 pp. (Viewed 28 July 2018. C00185-05). American Silver Co. (February 1934). Price lists with brochures for Claremont; Windsor. American Silver Co.; Windsor H&T; Windsor - Nickel Silver; Windsor - Kensico; Beaumont. (Viewed 28 July 2018. C00185-06). American Silver Co. (c. January 1935). Avondale pattern - price list with illustrations. (Viewed 28 July 2018. C00185-08). American Silver Co. / International Silver Company. (15 April 1935). Price list to C. T. Williamson Wire Novelty Co., Newark, NJ. (Viewed 28 July 2018. C00185-09). April 1935 - internal communication? American Silver Co. / International Silver Company. (25 April 1935). Multi-page document, ["outlining which patterns dies would be retained or destroyed or transferred to other lines"]. (Viewed 28 July 2018. C00185-10). American Silver Co. became part of the International Silver Company in 1935. After this date, it is assumed that any design patents utilized by the American Silver Co. division or brand were assigned to the International Silver Company. (See the ISC historical documentation page). American Silver Co. / International Silver Company. (29 July 1935). American Silver Co. patterns— complete set of new price lists of the American Silver Co. lines. (Viewed 28 July 2018. C00186-01). American Silver Co. / International Silver Company. (after July 1935). Silver plated hollow ware, [cat. no. 33]. 58 pp. (Viewed 28 July 2018. C00186-02). American Silver Co. (undated). Price list - Piermont pattern ["design especially adapted for hotel and public service use"]. 4 pp. (Viewed 28 July 2018. C00185-03). American Silver Co. (undated). Price list - Windsor - Kensico. 3 pp. (Viewed 28 July 2018. C00185-04). American Silver Co. (undated). Price lists - King George, Barrington & Fairmont. (Viewed 28 July 2018. C00185-07). Offline - Bristol Public Library (CT) - History Room collection.